Join us on this six-day intensive course where we will captivate you in the art of the Byzantium painting technique. During the course we'll write (paint) the icon of Archangel Michael. This “Archangel Michael ” icon will come alive before you as the visiting master iconographer and expert instructor, Theodoros Papadopoulos, guides you, step by step, through the ancient techniques of Byzantine Iconography. Let us journey together, discovering anew, this traditional artistic expression of theology and spirituality, often called the "meeting place of the Divine". Whether you are absolutely beginner or an advanced artist, this workshop offers an opportunity to learn and refine your techniques in this sacred art. The course focuses on the art of egg tempera painting. Our goal is for students to understand and learn the artistic practices as well as the philosophy of Orthodox Iconography. The coursework is divided into individual steps; the instructor explains the principles and then demonstrates each phase in detail, answering all questions. Through the process of demonstrations the stages as well the whole method of painting an icon will be presented. The students will then put into practice these skills under the guidance of the instructor Theodoros Papadopoulos. The techniques of painting will be taught in a clear and concrete way enabling the students to easily apply these techniques. From the very beginning to the completion of the course, every student will work on his or her painting with assistance by the instructor. The size of the icon is 34X25 cm. The schedule of courses runs daily from 9:00 until 16:30. Nevertheless, there is a possibility, if needed and depending on the progress of the courses, to extend the schedule by one and a half hours every day throughout the workshop and finish each day at 18:00. Therefore, please arrange your schedule so that if necessary to be able to stay until 18:00. 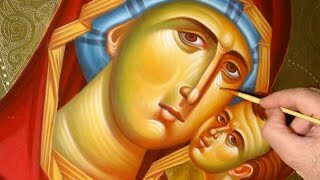 Click here to watch a short video about Theodoros Papadopoulos's Icon Painting workshops. St. Nektarios Greek Orthodox Church. Address: Wycliffe Rd, London SW11 5QR, UK. Course fee: £420. The price includes all materials including boards, pigments, brushes, etc. Registration is required and course space is limited. Please register early to guarantee your spot. A non-refundable deposit of £160 is required to reserve a place in this workshop. The remaining balance is due upon arrival on September 23, 2019. As soon as you make the payment using the button below, please send me your contact information (email, name and phone number). If you are interested in signing up, please make the deposit of £160 using the button below. To stay updated on future workshops, sign up for our newsletter by filling out the form below. You can form a group of students and Theodoros Papadopoulos can come and conduct the classes in your country of residence if you desire. © Theodoros Papadopoulos. All rights reserved.